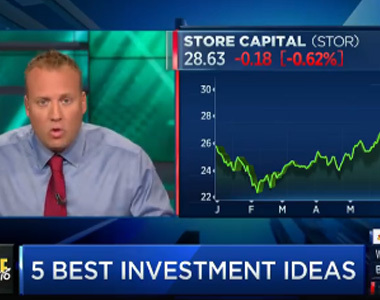 In a September 4, 2018 segment that aired on CNBC’s Fast Money Halftime Report, analyst Josh Brown emphatically described STORE Capital’s portfolio by saying, “It’s all of the businesses or tenants that Amazon can not Amazon!” He underlined the fast-growing net-lease REIT’s commitment to business sectors with long-term viability such as pet care facilities and health clubs. Brown’s analysis began with highlighting Berkshire Hathaway’s stake in STORE Capital. Known as the world’s greatest value investor, Berkshire Hathaway CEO Warren Buffet historically had been reluctant to invest in real estate, but after several years of monitoring the company eventually purchased a 9.8% stake on June 26, 2017. Describing STORE Capital’s sale leaseback benefits and value-creating real estate solutions, Brown also specifically stressed the company’s diligent portfolio management efforts ensuring long-term portfolio health. He recognized STORE Capital Chairman Mort Fleischer’s efforts as a pioneer in the industry and noted Oaktree Capital CEO Howard Marks’ initial support in the company’s launch as evidence of a strong management team. Joshua Brown is the CEO of Ritholtz Wealth Management, a New York City-based investment advisory firm. He has been named by The Wall Street Journal, Barron’s and TIME Magazine as the most important financial follow on Twitter. Josh’s blog, The Reformed Broker, (@ReformedBroker) is read by millions of investors, traders and advisors around the world.